We are an experienced team of fishing guides who have been teaching, guiding and conducting fly fishing trips full time since 1994. In an industry full of part-timers and fly-by-nighters, we are full-time professionals who do nothing but instruct and guide; 365 days a year. We cater to fly fishers of all levels, from beginner to expert, and we run trips on all the rivers in the Eildon/Thornton/Alexandra/Buxton/Marysville areas. We are also drift boat guides, having run boats down the Goulburn River on a daily basis since 1994, and each of our core guides can lay claim to 235+ days on the water each year. Our friendly team has taught literally thousands of people to fly fish over the past 24 years, and we offer the best Beginner’s Workshop in Australia. We also have some of the finest trout fisheries in Australia, right here on our doorstep. Our company is fully licensed to guide in New Zealand, and we run trips to the South Island in the months of January, February and March each year. Further to this, we lead trips to Idaho-Montana (USA), Patagonia (Argentina), British Columbia (Canada), and Los Roques (Venezuela). We are members of the PFIGA – the Professional Fishing Instructors and Guides Association of Australia, and we hold certificates in First Aid, Working with Children and Swiftwater Rescue. In 2002 we completed the construction of our fishing lodge, a beautiful mud brick building set on seventeen acres of private lakes. This building was home to our business for sixteen years, until we sold it in May of 2018. With the sale of the property, we closed our physical store, but all of our specialty hand-tied local flies are still available online, and via our local pick-up/delivery service. 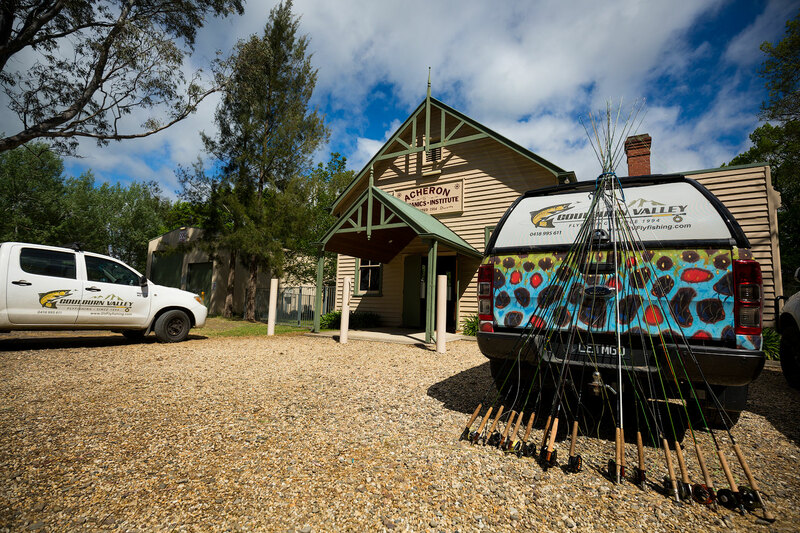 Our website ( www.gvflyfishing.com ) has evolved from what was one of the first fly fishing sites in Australia back in 1996, to an ever-expanding online resource for fly fishers. It is home to a large archive of content, including fly tying instruction, technical articles and fishing reports. In short, we are here to assist you with all of your fly fishing needs. Whether it be keeping you informed of the current fishing conditions, or offering unbiased advice on what gear to purchase, or taking you out fishing. We are always here to help. If you wish to speak with us about anything fly fishing related, you can reach us on 03 5773 2513 or 0418 995 611. We are available on the phone from 8am – 10pm every day of the year .